TyRex Group is a complete manufacturing service and technology solutions provider specializing in the high-tech industry. 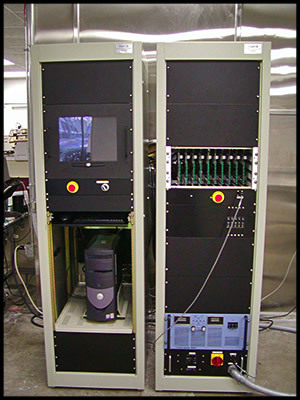 The TyRex Group provides manufacturing services for cable connectivity, circuit board design, electronic components, hardware and software installation, testing, and other applications. Dell and TyRex engaged Deaton Engineering to develop an automated fixture capable of simultaneously controlling and testing up to 450 fans for use during qualification of new computer cooling fan models. The data acquisition and control system necessitated independent control and monitoring of fan speed and input power. Additionally, the controller was required to recognize and disable a failed fan during testing. Multiple fan sizes and blowers needed to be fixtured and connected to the test system; a common, flexible mounting fixture was required to accommodate fans from 50mm to 92mm in diameter capable of providing power and signal distribution to each fan. 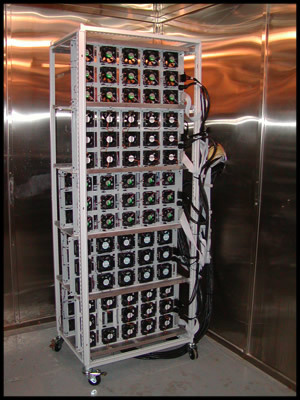 Deaton Engineering developed designs for the fixture’s circuit boards, fan mounts, power management and cable assemblies. These components were used to create the test device, which was integrated with a standard thermal test chamber. Performance testing included one week of continuous power cycling for all the fans at 70C. Parametric testing was performed at the end of the week, the fans were cycled through their range of speed, while monitoring the speed and power demand of each fan independently. This data was stored on the control computer and used to trend the performance of each of the fans in the test. This cycle of performance testing and parametric testing was repeated for 7 weeks. The first article was built, installed and verified to demonstrate the final product met the design specifications. The designs, drawings, and procedures for building and installing the device were transferred to Tyrex for use with Dell components.